Do you know what’s inside your word processing file? Just words? There’s a lot more than that. Take this file for instance. It looks like a pretty normal Word file, just a bunch of words on the page. It’s like a lot of files I get from authors to use in producing their book. But pour this into your page layout software and you might be amazed at what happens to it. Big spaces appear in your lines, misaligned paragraphs, just a mess. That’s because of all the things you can’t see. Take a look at what’s really inside this file, courtesy of Word’s View preferences. What a mess. You can see codes for tab characters, spaces, and extra paragraph returns lying around like so much litter. This author has probably been working on his manuscript for months, writing, re-writing and editing, and the file shows it. Just last week I was editing a manuscript for a client, and pasting parts of it into another file to organize it better. After the massive paste of about 40 pages of copy, dozens of old Word comments from a previous editor popped up throughout the file, still embedded from months ago. 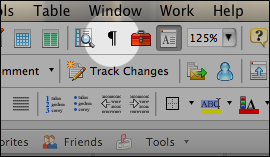 You can turn this view on and off from Word’s Preferences dialog, in the View section. Here you can decide whether to display tabs, spaces, paragraph marks, optional hyphens, hidden text, or all of the above. But usually the quickest way to turn all the hidden objects display on and off is right from the toolbar. Click the paragraph mark symbol to toggle the view between all showing and all hidden. Having this toggle right on the toolbar means you never have to have a file go to layout—whether you are doing your own book or sending your files to a book designer—with a bunch of code in it that can cause unnecessary delays down the line. As with all production issues, it really pays to catch these as early in the process as possible, as soon as the final edited files are submitted for production. The other tool that’s invaluable for clean-up in Word is the very brawny Search and Replace function, which I’ll address in another post, as we continue to add to the Book Construction Blueprint. But with this one tool in your toolbelt, your files will already be in much better shape. One helpful tip I want to throw out there – I’ve noticed that in my ongoing revisions of my manuscript, I’ve wound up with a space either just before or just after a hard return in many places. The easiest way to hunt them down is to use the find function, of course – just type ^p with a space before or after as appropriate (The ^p is a stand-in for the paragraph return symbol). Good tip, Dave. You might want to check out the other tips in this article: 10 Quick Tips to Get Your Manuscript Ready for Publication. Hi Joel, My questions are at the end. Please forgive the wordy preamble to them, but I think it might be necessary. I have had an editor working on my non-fiction book in Word. The editing of content is pretty much done. However, the formatting just isn’t coming out the way I would like it to. For instance, I printed the latest editor’s revision of the book double sided to get a better idea of the look. The left margin is narrower than the right margin and so when I cut the book down to size, some of the text is cut off on the even pages. I wanted ink tabs (I don’t know the correct name but along the outside margin of the pages in 5 of the chapters I want a black background with white words vertically oriented text book to indicate which chapter this is for example, “Meditation”.) That way when the reader wants to quickly access that chapter for exercises of meditation to do, they can easily see from flipping through the book or looking at the side of it where that chapter is located. In the next chapter the “ink tab” will be printed an ink-tab height lower so that they are staggered for easy access. This just isn’t coming out. Some of the ink tabs in the printed out sample ended up on the interior margins! So to get to my questions: 1.) If I purchase for example your Britannia template, will I have to get rid of all the formatting that the editor has done to insert the content into the template? 2.) In the Britannia template, I don’t see an epigraph in the sample. Would I be able to insert quotes under the chapter headings? If so, could I put them in italics or does the template have a particular font for the epigraphs? 3.) I now can see the limitations that the editor has. (She normally edits scientific papers but said that she could edit a book format as well.) Do you or someone you would recommend offer a service of taking a formatted book such as mine and then putting it into a template such as Britannia? Thanks so much, Joel and your contributing article authors. This information is so valuable and would take years to find out the hard way! Part of your problem seems to be relying on your editor to do your formatting, which probably isn’t the best use of her time. Your best solution may be to use our templates and have our staff do the formatting for you. It’s quick, efficient and friendly. You can find out more about this and see if it suits you on the template site here: Book Design Templates Services. Dear Joel, I’ve been sedulously following you. Thank you for your tips and advice. I now have a problem I cannot resolve – my Formatter. In January I paid in advance, having mentioned the book has more pages than those demanded by a novel, and needs an Index. Apart from noticing obvious gaps in spacing, I’ve corrected errors of formatting in the drafts which, had these appeared, would have cast a slur on my command of English. Four occasions on which I had planned to market my book have passed. It is nowhere near ready. Corrected drafts are not sent when promised. Can you or your readers advise my next step. Should I just give up? Start anew? Sorry to hear about your troubles. You don’t say whether you’re dealing with a book designer or an ebook converter, since “formatter” could cover both. You might suggest that you have a deadline and if you can’t get the work in the time needed you’ll need to look elsewhere. Alternately, cancel the contract and ask for the files with the work produced to date, pay a percentage of the fee based on how much has been completed, and move on. Since my Word file on my novel went back years, I took the advice that you and others have given to strip out ALL the formatting with the nuclear option before formatting (I used one of your book design templates, actually — thank you). However, finding and putting all the italics back in was drudgery. Is there a less nuclear option for stripping out all the garbage that will preserve italics? Would rich text format fail to get the job done? Sandra, sorry to hear about the drudgery. There are workarounds for doing the nuclear option. For instance, in Word you can search for instances of italic and mark where they begin and end with a character not usually used in text, like the tilde (~), then go back and do a Find/Change to replace the italics.